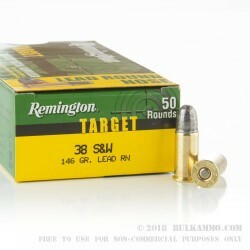 This Remington target round is loaded with a .38 S&W 146-grain lead round nose bullet with a waterproof sealant over the primer and case mouth for reliability and is capable of a muzzle velocity of 685 fps. Ideal ammunition for wheel guys looking for an inexpensive, high performing, reliable practice or plinking ammo. 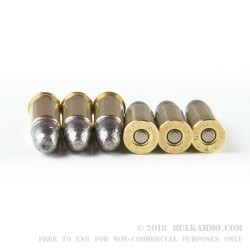 This ammunition is loaded into boxer-primed, reloadable brass cases and is noncorrosive. 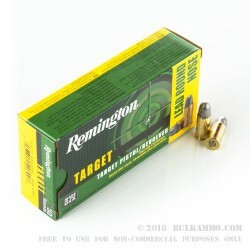 Each box of Remington target .38 S&W comes with 50 rounds. Beginning with their first rifle in 1816, Remington has become one of the most legendary firearm and ammunition manufacturers in the world. Using state-of-the-art research and technology out of their development facility at the Rock, Remington is at the forefront of new firearms technology, while still delivering legendary performance.